When it comes to scheduling, I send home a form with students outlining all the time slots available for conferences. I instruct the parents to mark their top 3 preferences with a 1, 2, and 3, and to put an X on any times that will NOT work. Once all parents have returned the forms, I can put together a schedule that works for everyone. I can schedule in breaks for myself where needed, and accommodate parents’ needs at the same time. I do the music also, and I will have a few candles burning (usually something like vanilla, soft, in case of allergies). I try to always have something to give the parents, an article on study skills, a fun way to read together at home, etc. I also always keep notes of the meeting as well as having a spare notebook for them to write in if they want. That way they see how important I take the meeting. In the hallway I put the pictures I have taken and put them on the wall for all the parents to see. I also put a little desk outside the classroom with some candy there for the parents. On the desk I usually add a class book we have made. After I meet with the parents I give them a list of fun activities they can do at home with their children to reinforce what we are learning. Something I have done in the past is a few days before Parent/Teacher conferences, we send invitations to the parents to let them know what the times and dates are and put the phone number of the center in case this is not a good time for them. We decorate a table in the room with refreshments such as homemade punch and cookies. We also let them know that we will be having a portfolio of their child’s work for them to take home. I have soft music playing in the background. It seems to soothe the parents and myself as well. I also had cookies available to the families. This way it doesn’t seem so intense, it’s more of a celebration of accomplishments. For years now I have done Student Led Conferences. The students have a little booklet that they go through with thier parents. We go through it the day before at school so the kids know exactly what to do. In the booklet there is a checklist of the things they are to do with their parent or visitor and they include things like: serve coffee and cookies to your guest, have them give you a spelling test, do the Calendar activities with them, fill out a comment sheet, give them a tour of the school and class. The last time I did this, last term, I had 100% attendance and not one parent wanted to meet with me! The parents that do have concerns had met with me before this time so that they could spend the confernece time with their child…it’s all very relaxing and the kids love to show off their work. I have done this with grades 2-4. 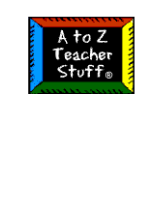 © 2019 A to Z Teacher Stuff Tips for Teachers. All Rights Reserved.